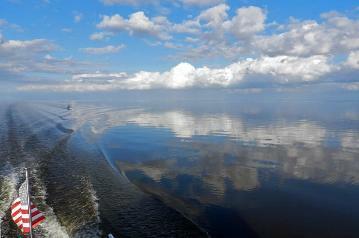 A late afternoon, remarkably calm, crossing of Lake Okeechobee - the metropolis of Clewiston on the horizon. 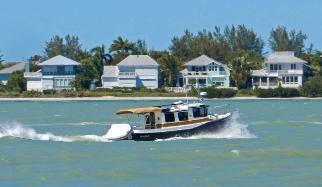 cruise to the Florida West Coast. Sno' Dog outing with granddaughters Georgia (4) and Lucy (5). 1:00 PM - quick stop at Tuschicks, Palm Cty. 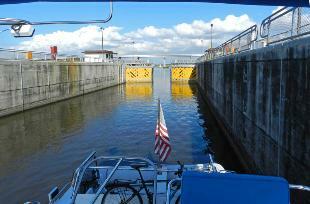 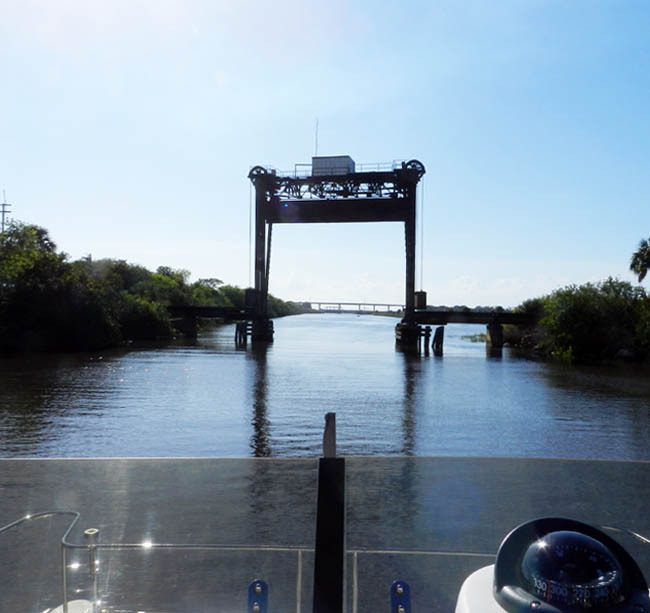 Arriving at the St Lucie Lock, gateway to the Okeechobee. 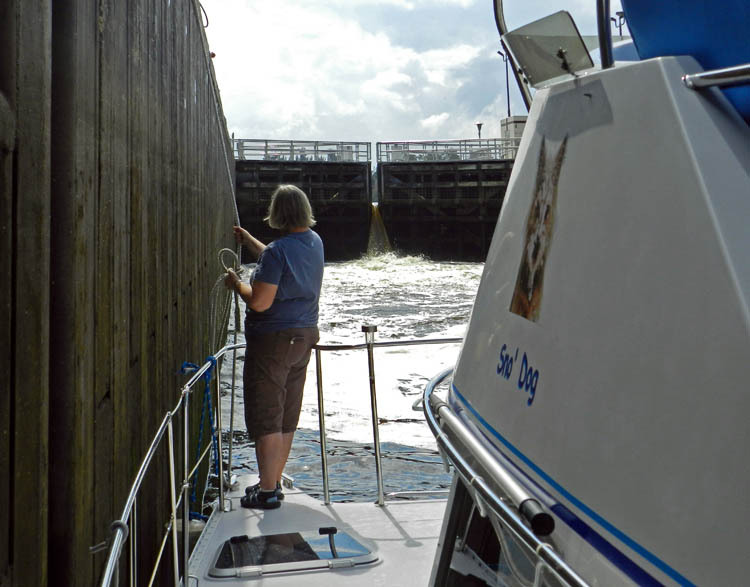 St Lucie lock gate - note man standing on top. 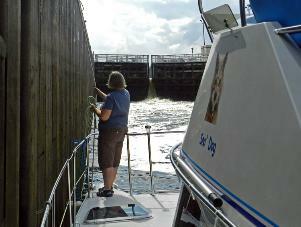 In the turbulent St Lucie lock - reminiscent of France! 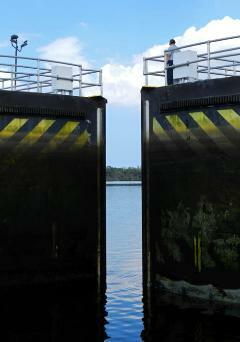 A 12-foot rise here, no lack of water in the lake now. 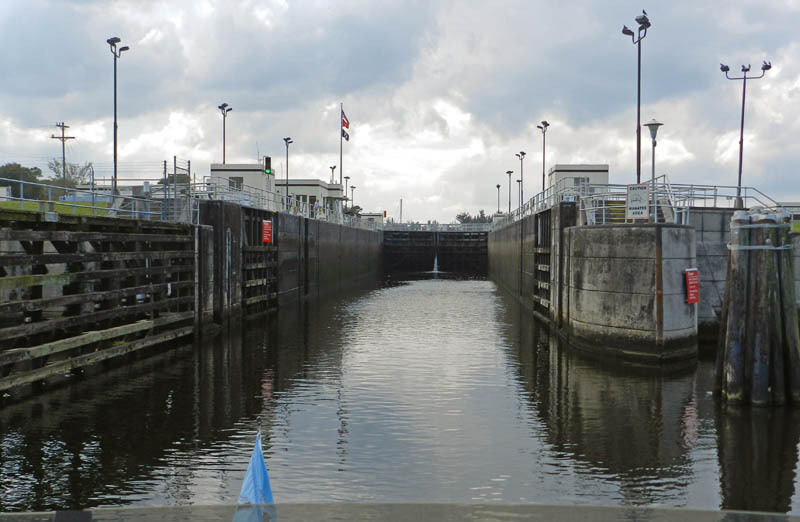 The port Mayaca Lock - no level change here. 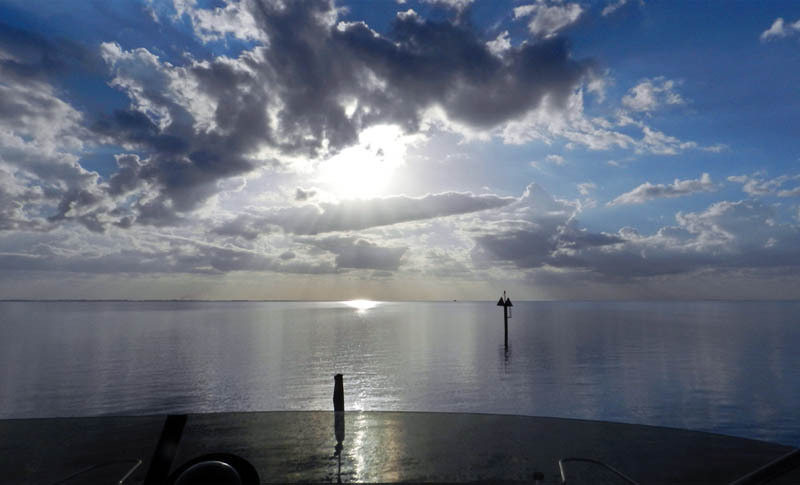 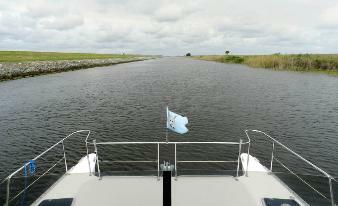 limits height on the Okeechobee Waterway to 49-ft.
ends and the sky begins. A realy fine day to cross the lake! 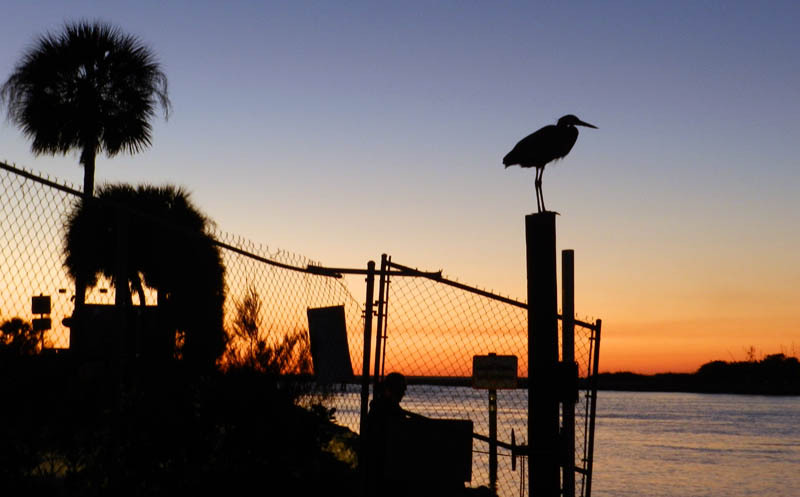 Just in time for Ft Myers Art Festival! March 4 - Stayed at Sanibel. (Strong northerly winds). 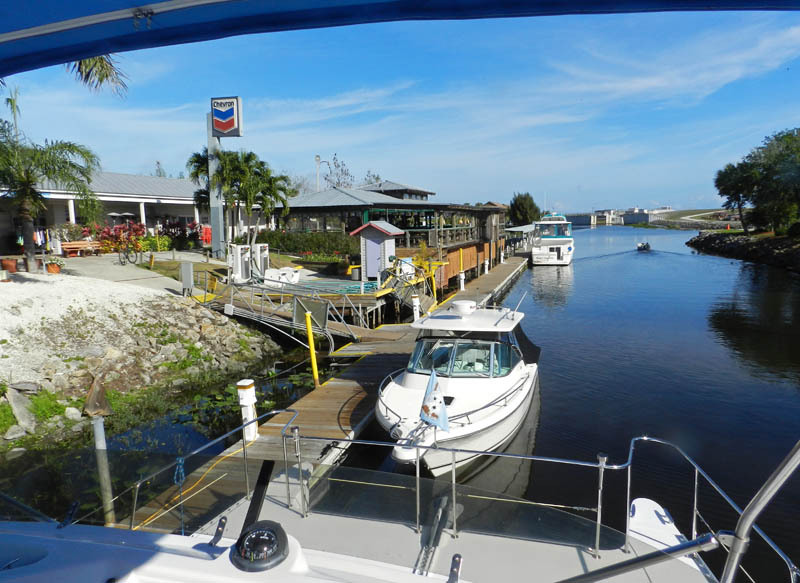 Gramma Dot's Restaurant at the Marina - Exc! 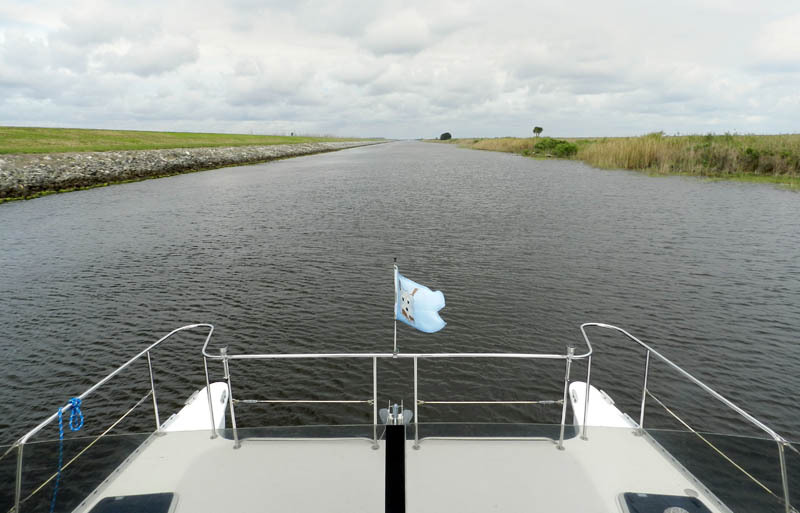 The Okeechobee rim canal between Clewiston & Moore Haven. Docked at Roland (& Mary Ann) Martin's Marina in Clewiston. 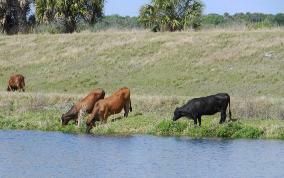 Cows along the Caloosahatchee River. 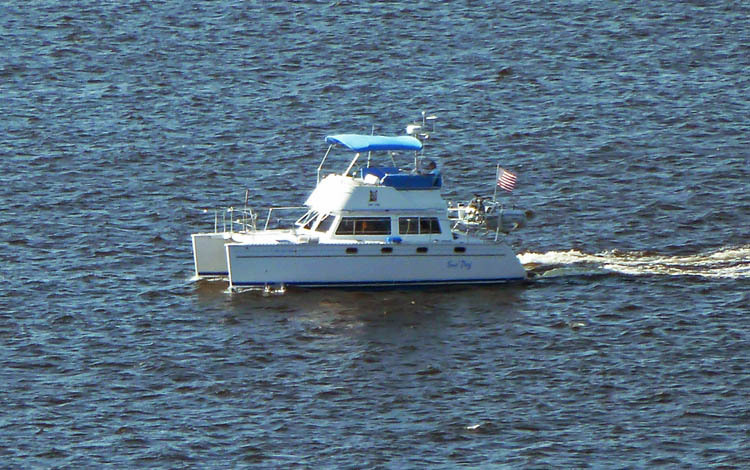 taken by Russ Kimble, new owner of PDQ 34, "All that Jazz"
- formerly Paul & Ann Gooding's "Horizons". 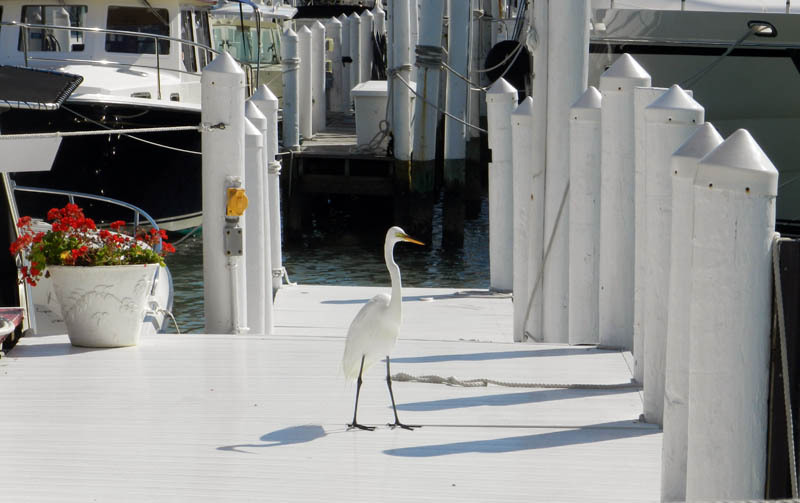 after spotting us passing by their condo - and taking photo on right! 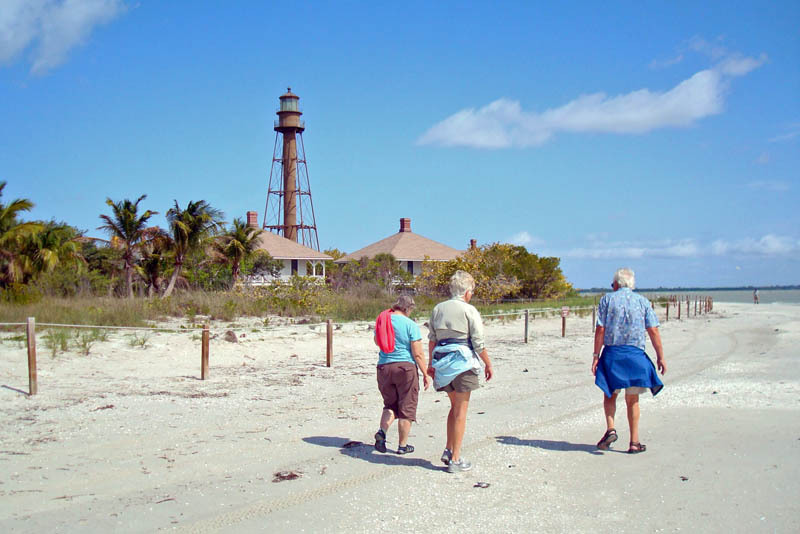 - click photo to see larger image. 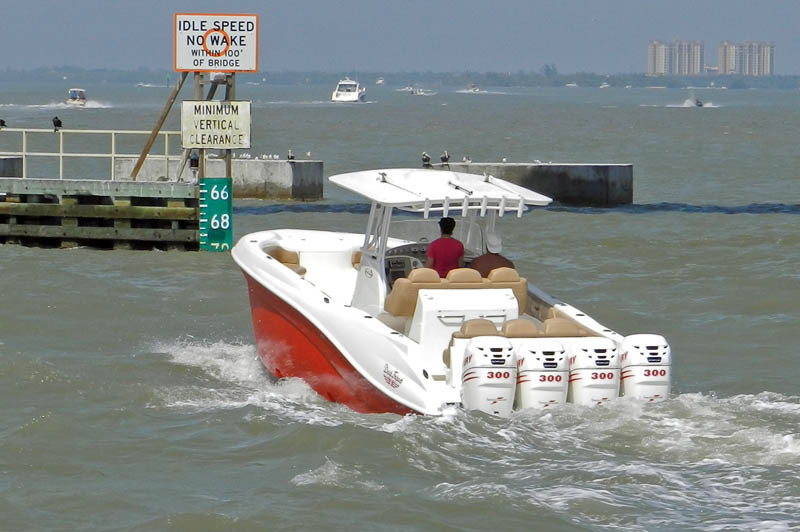 consumption must be well over 100 gallons/hour! 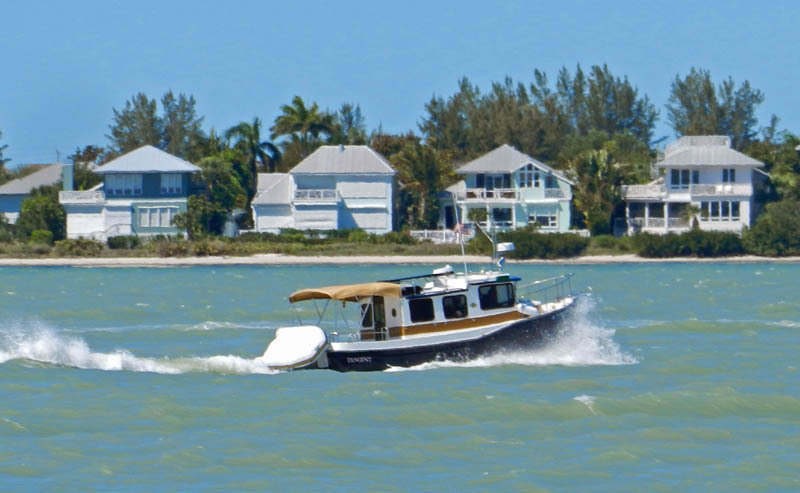 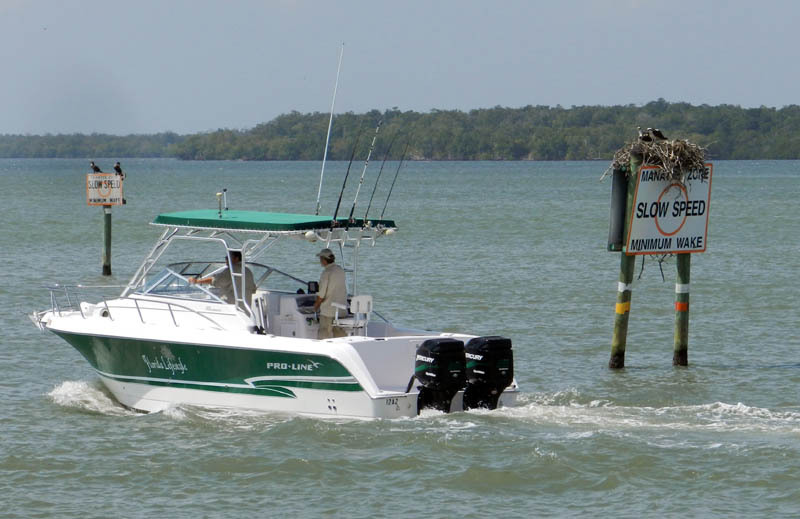 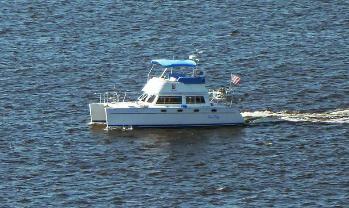 Sno' Dog and Cat's Away tucked in - dinghy-to-dinghy - at the Sanibel Marina. Nancy, Sue & Harvey on the beach at the tip of Sanibel Island. 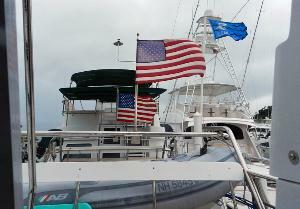 As the cold front came through, our flags were out straight. 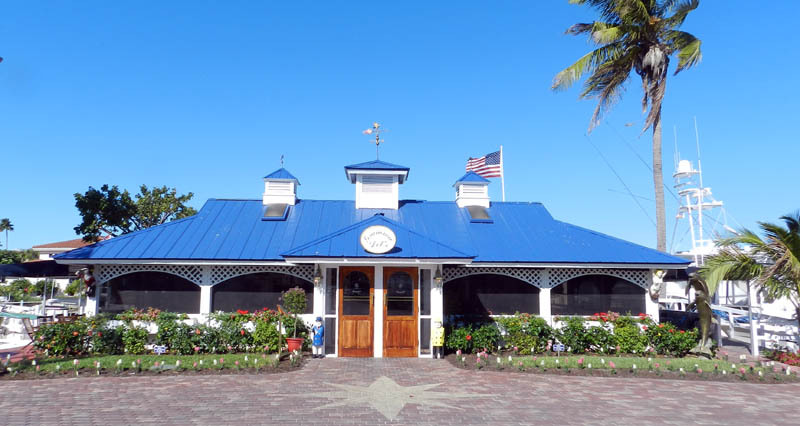 Gramma Dot's Restaurant at the Sanibel Island Marina. Filled Fuel Tanks: 98.4 gal. 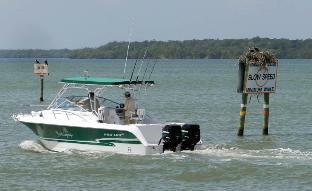 265 n mi since last fill-up. Rode courtesy bikes downtown, pretty place. 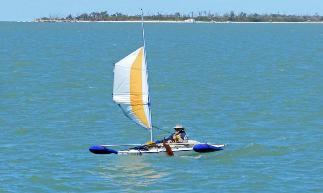 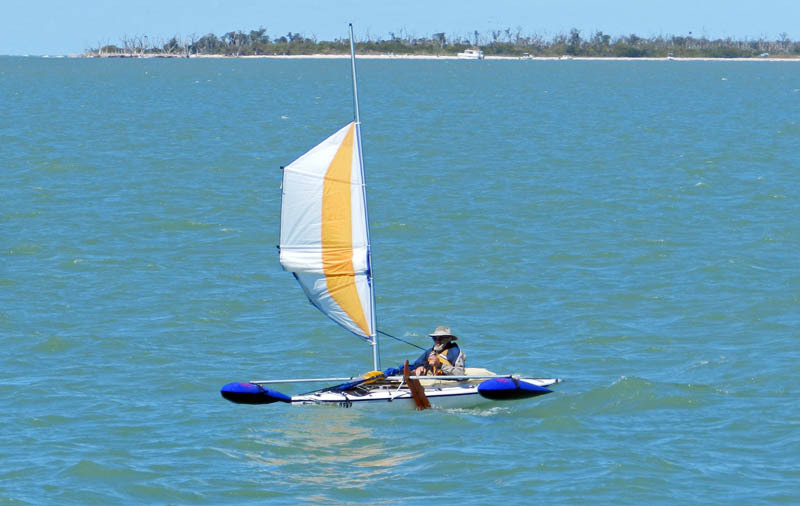 A sailing kayak off N. Captiva Island. 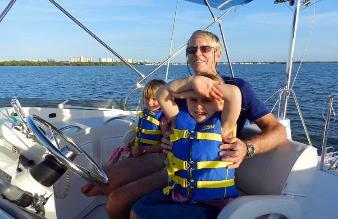 into the chop near Boca Grand Inlet. 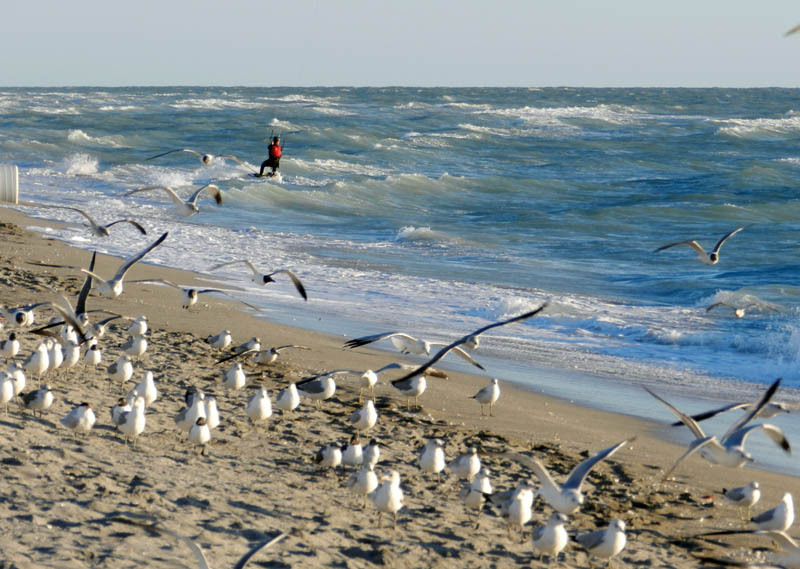 but the kite-surfers were having a ball. 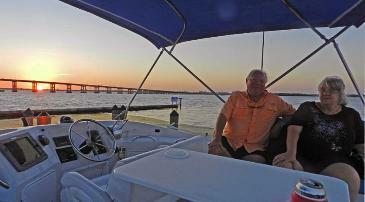 Sunset at the Crows Nest Marina in Venice. 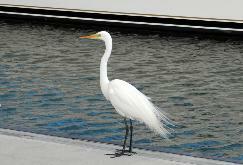 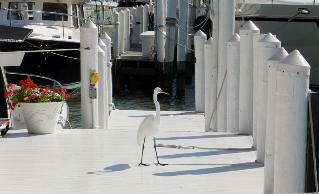 A not-too-shy snowy egret on the dock.